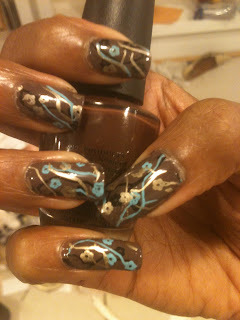 Gomen gomen - I've been gone for a bit, but I'm back with another yummy konadicure! As I said before I love fall because I finally get to break out some of my darker shades of polish. While OPI's You Don't Know Jacques has been out for several seasons it's still one of my most reached for perennial favorites of the fall. The color lands somewhere between a chocolate gray mix and into the depths of my lacquer loving heart. So of course the minute I thought, "I want to create a wallpapery looking manicure" I instantly grabbed up YDKJ for the backdrop. I decided to use a combination of pastel blue, black, and gold to keep things from getting too dark and ended up falling in love with the final product. I love how cG Passion adds just the right amount of subtle sheen! So much that I'd actually really love to have this as real life wallpaper. Somehow the cuticle chipped on my thumb - boo! between indoor and outdoor lighting! Want to recreate the look? Then check out the tutorial below! You can expect more wallpaper like designs from me in the future as I have a secret hidden love for the stuff, and tend to keep an eye out for patterns I love. If you come across any beloved prints please feel free to share. Thanks for reading and see you next time. Yay I'm so glad to see you here! How fun - I've been over to your blog many times as well since you mentioned it and visiting was part of the reason I decided to start my own blog. 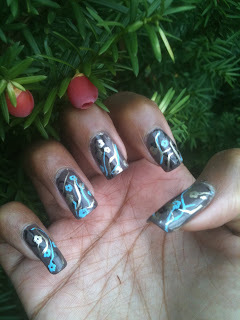 Plus I realized compared to YT the blog nail world is massive! Gorgeous mani! I look forward to watching all your YT videos. Maricza thank you so much! And thank you for joining my blog! I haven't quite figured out yet how to put up a gadget that shows my YT videos but you can still get to my channel from the one's I have posted. 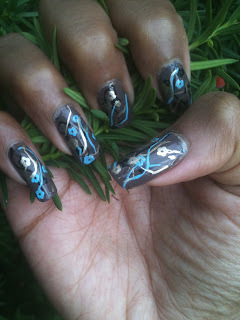 Stay tuned for LOTS of new nail art postings coming up!